The P5e is the latest edition in the unbraked trailer range. 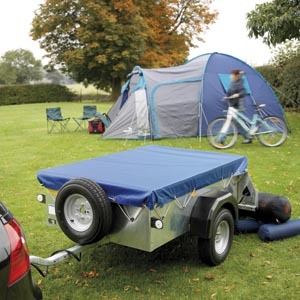 A small, convenient and compact trailer aimed at the domestic user, the P5e maintains the structural integrity associated with all Ifor Williams Trailers. The P5e offers excellent strength to weight ratio with a maximum gross weight of 500kg. As the narrowest trailer in the unbraked range, the P5e can be towed with ease and its deep sides ensure load volume is not compromised. The P5e is ideal for transporting heavy and awkward loads that your car can’t quite manage. From transporting chippings, sand and gravel, to plants, furniture and domestic appliances, without forgetting the regular trips to the skip, the P5e is an ideal small trailer that can be towed by most domestic cars. The P5e is available with a ramp or tailboard as standard. The P5e is an unbraked trailer and as such should be used with regard to the Road Vehicles (Construction & Use) regulations 1986, which state that the towing vehicle must have a kerbside weight of at least twice the gross weight of the trailer. Therefore, for example, the maximum gross weight of 500kg will only apply if the kerbside weight of your towing vehicle as stated in the manufacturer's handbook is greater than 1000kg. If the kerbside weight is less than this figure, the maximum gross weight of the trailer must be reduced accordingly. The vehicle manufacturer may further restrict this figure by stating a maximum weight of unbraked trailer which may be towed, this must also be taken into account.